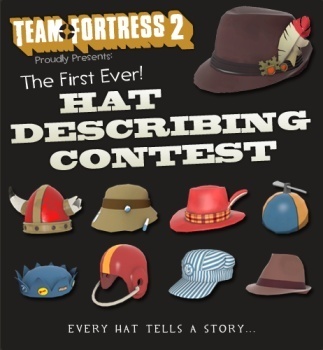 Gamers who have been excluded from past Valve contests by their shameful lack of useful talents should check out the first ever TF2 Hat Describing Contest, which has lowered the bar to entry to nothing more than functional literacy. I've never won a skills-based content. That's because I have no skills that are of value to anyone except perhaps my cats, who, I like to think, appreciate my diligence in keeping the litter box clean and the food dish full. Fortunately, Valve has finally decided to take pity on people like me with a contest that requires nothing more than the ability to spell two-syllable words. The Team Fortress 2 Hat Describing Contest should be fairly self-explanatory but for those who might be a little slow on the uptake, here's the skinny: Team Fortress 2 features a lot of weird hats and the writing team apparently can't be bothered to come up with decent descriptions for all of them. So they're dumping the job on you! The rules are simple: Describe your favorite TF2 hat in 75 words or less. The best entry for each, as chosen by the TF2 team, wins. You won't actually get anything for winning - it's kind of a crappy contest - but you might see your description used in the game. It's safe to say that this probably isn't the sort of competition that will land you a job with Valve, but it might be an amusing way to blow a few minutes at the tail-end of your lunch hour. Sound hot? Have a look at the TF2 Hat Describing Contest FAQ (which is comprised of precisely one question and an 11-word answer) and jump into the action on the Steam forums!